Thanks for clicking the URL in my Twitter profile - let me give you a little background on who I am and what I do. My name is Rod Sloane and I’m the man behind RodSloane.com and the @rodsloane twitter account. You can read a little more about my story on Rod’s Marketing Story page - but let me take a moment to give you a bit of glimpse at who I am and what I do. I’m a 50 year old Englishman living in Ealing, London. I am married to Mary and together we have a 17 year old daughter. Since 1999, I have been a full time marketing consultant. I’ve been Podcasting since August 2008. My podcast is the Rod Sloane No Bull Business Radio Show. You can subscribe to my podcast from either the iTunes Music Store or my website. You obviously have an interest in Twitter because you’ve clicked through on my Twitter Profile link. I’d enjoy connecting with you there via my @rodsloane twitter account. If you follow @rodsloane you’ll get a variety of things. Firstly you’ll see a glimpse of the behind the scenes in my work, life, speaking and reading. I share a little of what I’m up to, share links of what I’m reading, talk about posts I’m working on and give insight into the life of a full time marketing consultant. 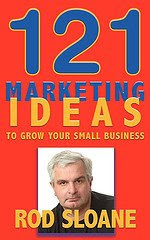 I am the author of 121 Marketing Ideas to Grow your Small Business. 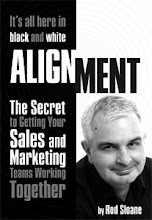 This is a practical business book that cuts through the clichés and attacks all the typical marketing wisdom that doesn’t work. Thanks for visiting my about page - if you’ve not already don’t forget to follow me on Twitter so we can interact there. I’m also relatively active on other social media sites like Facebook, LinkedIn and Ecademy.